Weight Watchers Mobile. It’s more convenient than ever to connect to Weight Watchers from wherever you are. Get the latest recipes, health news, exercise ideas, and more, all on your phone when you are on the go. 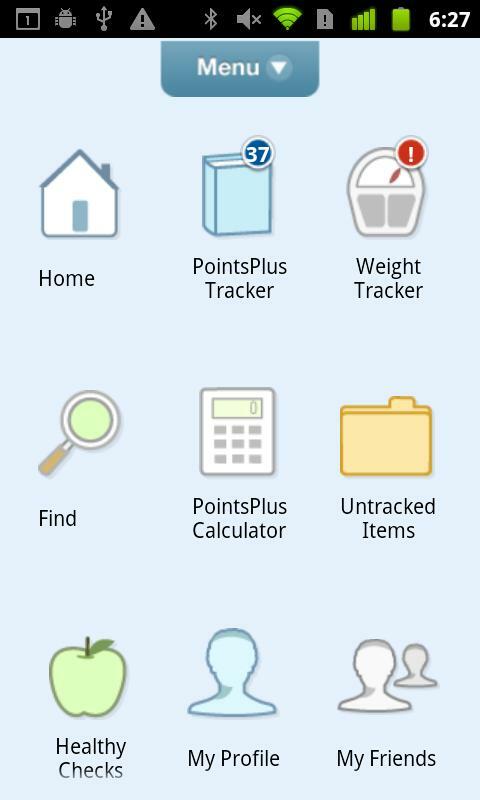 Plus, our Android App is fully compatible with our PointsPlus® program, so you can keep track of your weight loss anytime, anywhere. A fantastic way to track what you eat, get point information, read articles, etc! Great convenience to have a calculator and huge food database at your fingertips! The app itself is HUGE and takes up a lot of space on your device. It just went from Beta to version 1.0, so it still has bugs and occasional crashes to work out. I’m a serial Weight Watchers user. Weight is something I, like many of us these days, struggle with and I have a bad habit of using the program until I successfully loose the weight then leave and gradually go back to my old bad habits; then I put it all back on (Repeat.) I’ve lost a lot of weight on the program over the years, and my inability to keep it off is more because I stop doing it than because the program doesn’t work. But we aren’t here to debate the relative merits of the program itself, I just wanted to make sure you know this review comes from someone who knows the ins-and-outs of their programs. Now, for the ap itself, the first thing I noticed was that it is seriously huge. It requires 17MB of internal storage just to download the app, and then once you do, it needs another 30MB of space to download all the databases. If you have a device that doesn’t have a lot of memory, this is a problem. Believe it or not, that’s gotten a tad bit better since Beta, but it is still a major issue, and one of the greatest most people complain about. In addition, it does still have the occasional crash. It was quite a bit worse in Beta, so the developers have gone a long way toward fixing the issues, so this is something I’m willing to set aside for now, simply because they have demonstrated that they are aware of the problems, and they are actively working to fix them. and, with a free registration, the ability to connect with friends, update your profile and upload photos. and it unlocks all of the interactive Cheat Sheets. This is a lot of data and information in one central location. Quite a bit of the app, because of the database download, is available both on or offline, and subscriber tracking information is either synced directly to the site if the phone/tablet has an Internet connection, or it saves it to be synced the next time you get one, which is a nice feature that allows you to track without worrying about where your next Wi-Fi access point will be. If you’re a Weight Watchers subscriber, then you need this app, now. I know it’s huge, and I know you’ll probably have to go through and cull out a few other apps you aren’t using to install it (if you’re like me and have an insane amount of apps installed at any given moment.) However, it’s worth it. The tracking tools, the calculator, and the ability to access pretty much everything you need from your device is a serious convenience that makes the program that much easier to stick with. It’s a lot harder to tell yourself you don’t have time to track when all you have to do is tap the screen on the device you already carry with you everywhere a few times. The app is pretty feature-rich, so while the main features like tracking and searching, are pretty easy to figure out quickly, especially if you’ve used their tools in other formats, there is a lot here to explore. The interface itself is pretty clean and intuitive, especially if you’ve ever used Weight Watchers’ online site or any of their other tools. The look and feel matches those perfectly, for a very seamless experience no matter where you choose to access and track your information. Should you Download Weight Watchers Mobile? If this app took up a bit less room on my tablet, I’d give it 5 stars. As it is, it is a seriously good app, but the sheer size just makes it a bit impractical for every person who uses it. I would love to see a way to pick and choose which databases you want, so people could have the option of installing the full thing or just the pieces they use to open that up more. However, for what it is, this is an extremely powerful weight loss tool, and if you’re using the Weight Watchers program, it’s one you really can’t afford not to install and use.